July 25, 2016 – Osborne, Kan. – Osborne Industries, Inc., is pleased to announce that the U.S. Patent and Trademark Office has recently awarded Patent No. 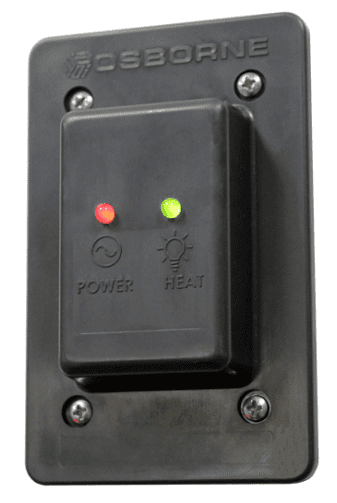 9,361,770, for one of the company’s newest products: the Osborne Heat Pad Indicator Light. For more than 40 years, Osborne Industries, Inc., has been developing innovative products for the pig production industry, designed to facilitate informed management decisions, increase operational efficiency, and improve producer profit. The company’s commitment to the industry is evident in the newly released electric indicator for its signature Stanfield® pig heating pads. The device provides visual confirmation that individual heat pads are operating properly and offers producers an added level of assurance that heat pads are providing the heat necessary for optimum piglet growth and development. Unlike other devices available for competitive heating pads, Osborne’s product features two bright LED lights. The unique and newly patented device shows that electrical circuits are functioning properly, and that individual heat pads are drawing electricity and providing the necessary heat for young pigs. The addition of the heat pad indicator to Stanfield heat pads eliminates the need for infrared temperature wands or physically inspecting individual pads to ensure they are operating properly. Both LED lights of the Heat Pad Indicator remain consistently bright, regardless of variable watt power, which is a patented feature of the device. If the temperature of a heat pad is controlled by a ramping controller to compensate for the reduction in heating required for piglet development, the LED lights remain consistently bright and visible, even as power is reduced to the pad. The heat pad indicator light is a powerful diagnostic tool and large systems of heat pads, equipped with electric indicator lights, are already being used by producers. “The Stanfield brand of heat pads has been the standard for providing uniform, under-body heat for newborn piglets for more than 40 years,” said Osborne’s Sales and Marketing Manager, Amy Conrad. “The reliability of the Stanfield brand is further solidified with the addition of the Osborne Heat Pad Indicator Light since farm personnel now have a visual way to reaffirm their heat pads are operating properly.” The heat pad indicator light will alert producers to farrowing stalls requiring attention, so piglets are never without heat. For more information on Osborne’s latest patented product or the company’s complete line of pig production equipment, please call 1-800-255-0316 (1-785-346-2192) or visit osbornelivestockequipment.com.